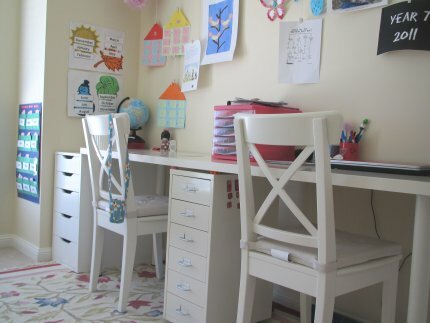 Maria from Our Home’s Cool shares her newly decorated homeschool classroom with us to give us ideas of how to set up our own classrooms. Let’s take a look at Maria’s classroom and how she gave it an overhaul. Evaluate your space available, listing the pros and cons. …and voila, a new workspace for her girls. The area has been streamlined and provides an efficient space for homeschooling. I love the crisp, clean appearance. It’s very inviting…a place her children can call their own. Good job, Maria! 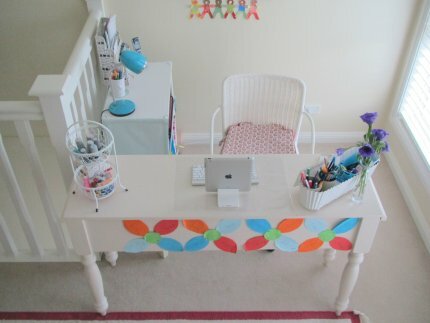 Maria has a desk area set up for her lesson planning and teaching supplies. 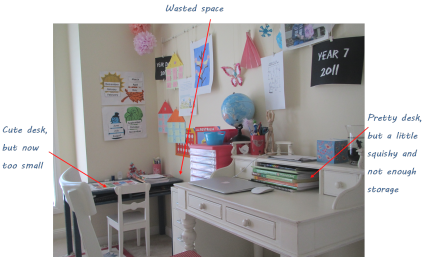 Her space evaluation determined that her desk needed painting and she also needed more storage area. She picked up a wire trolley/storage unit that also needed painting and made a cloth skirt to enclose the back and sides. Her area is also bright and cheery. Notice how she tied in the color of the lamp with decorations on the desk and wall. She has all her teaching supplies organized and easily accessible. It is a pleasant place! Have they outgrown their current desk? What electronic equipment/outlet plugs are needed? Where will you do messy projects, like art projects or science experiments? Where will you keep your planning and teaching supplies?